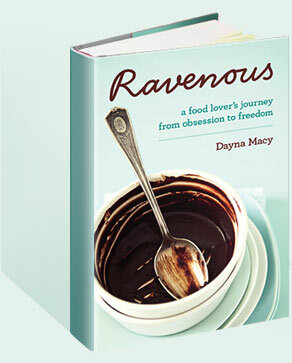 2008 July — Dayna Macy, author of "Ravenous"
I recently wrote a piece for Yoga Journal titled “Eat Like a Yogi”. In the piece, I interviewed some of the top yoga teachers in the United States on what they ate and why. I was inspired to write the piece because there are a lot of assumptions about food in the yoga world, namely, that if you are serious about yoga, then you’re a vegetarian. There are those who disagree, who say that if you practice yoga then you must adhere to the tenet of ahimsa, or non-violence. And eating meat is a violent act. Yes, but so is eating. I do think a vegetarian diet is healthy for many people, and much better for the planet. But I don’t believe in a one size fits all philosophy. It’s often easier to see the world in terms of black and white, or to think that following a spiritual path means living only one way. It’s harder to feel your way into your own truth, and respecting whatever it is you find there.